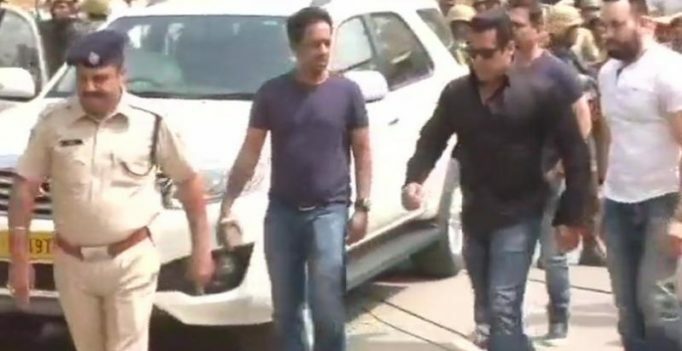 Jodhpur: A Jodhpur court has found actor Salman Khan guilty in the 1998 blackbuck poaching case while acquitting actors Saif Ali Khan, Sonali Bendre, Tabu and Neelam who had accompanied him in that hunting trip 20 years ago. After the verdict, the actor’s lawyers argued that Salman Khan be placed on probation or given a mild sentence. The maximum punishment for this offence is six years. The blackbuck is an endangered species, protected under the Indian Wildlife Act. The court will decide the actor’s sentence soon. If he is sentenced for less than three years, Salman Khan will be given bail. If not, he will be taken to the Jodhpur Central Jail to appeal separately for bail. Salman was the main accused in the killing of two black bucks in 1998. Actors Salman Khan, Saif Ali Khan, Tabu, Sonali Bendre and Neelam arrived in the Jodhpur court a little before 11 am when the verdict was pronounced. Salman Khan’s sisters Alvira and Arpita were also in court. There was tight security in and around the court with emergency response teams and women commandos deployed. Final arguments of the case were completed in the trial court on March 28, after which Chief Judicial Magistrate Dev Kumar Khatri had reserved the judgment for Thursday, April 5. Salman Khan was accused of killing two blackbucks in Bhagoda ki Dhani in Kankani village near Jodhpur on the intervening night of October 1-2, 1998, during the shooting of the film Hum Saath Saath Hain. He faced charges under Section 51 of the Wildlife (Protection) Act and the other actors were charged under Section 51 read with Section 149 (unlawful assembly) of the Indian Penal Code. Maximum punishment under Section 51 is six years. The killing took place near a village of Bishnois who are passionate about protecting the animals. On hearing the gunshots, the villagers had come out running and some were among the 28 witnesses who were interrogated in the probe. They gave the Gypsy a chase with their bikes after finding the carcass of the dead animals at the spot. “All of them were in a Gypsy car that night, with Salman Khan in the driving seat. He, on spotting a herd of black bucks, shot at and killed two of them,” Public Prosecutor Bhawani Singh Bhati had told court. “But on being spotted and chased, they fled leaving the dead animals there,” he had argued, adding there was adequate evidence against the actors. Denying these allegations, Salman Khan’s counsel HM Saraswat had said there were several loopholes in the prosecution’s story and it had failed to prove its case beyond any doubt. “Prosecution has failed to prove the allegations. It engaged in tampering and fabricating evidence and documents as well as roping in fake witnesses to prove its case,” he said. “It even failed to prove that the black bucks were killed by gunshots. Hence, such investigation cannot be trusted,” Saraswat said. The case also involved two more accused, Dushyant Singh, who was allegedly accompanying the actors when the poaching took place, and Dinesh Gawre, said to be Salman Khan’s assistant. However, prosecutor Bhati says that Gawre never appeared in court and was made to disappear by Salman Khan. Had he been around, there could have been more information available in the case, he said. In the last 20 years, Salman Khan’s counsel has argued that the actor was not armed or that he was carrying an air rifle which does not kill. It was also submitted in court that the animals might have died of overeating or that stray dogs killed them. Salman had also said in an interview that the deer were caught in a bush and that he actually saved them. Dangal becomes Aamir Khan’s second film to enter 300-cr club!